The Flash returns to television this week! Hooray! After leaving us on such an awesome cliffhanger in the midseason finale, I have been dying to see where the show was going to pick back up. If you are (or ever have been), an avid Flash reader, then you know Barry Allen has a classic, defining storyline called “The Trial of the Flash.” It was after this storyline that this midseason premiere was named. This classic storyline also provides the spine for the narrative upon which tonight’s episode was built. The original “Trial of the Flash” story does deal with the Flash being framed for murder—just like the on-screen Barry Allen—but the circumstances surrounding the false accusation are darker and more dismal. Whereas Iris West was saved from meeting an untimely end by the striking heroism of H.R. Wells, in the comic book, Iris had actually passed away. Much of the beginning of the arc focuses on Barry’s relationship with his new wife, Fiona. Given the prominence of “We are the Flash” and the recent West-Allen nuptials, I think it’s fair to surmise that this part of the classic “Trial of the Flash” will remain a piece of history and not find its way onto the small screen. As you might have guessed, Eobard Thawne was the person responsible for Iris’ demise. The Reverse-Flash had his eyes on keeping Barry Allen from any and all happiness, you see, and he planned on killing Fiona as well before she and Barry even got to the “I dos.” Fortunately, Barry is able to save the day, but only by breaking Eobard’s neck. I think it’s a very interesting dichotomy between the genesis of the storyline where Barry worked under the quick logic of “the ends justify the means” and the character’s complete and utter innocence in the matter of Clifford DeVoe’s death. This change definitely makes it easier for us to feel bad for Barry, and it also makes him a lot more like his biological father, Henry Allen. You have to think Harry would have quite a lot of advice for Barry if he were still around! It has taken until the second half of the fourth season of The Flash for Barry Allen to really start acting like his biological father. Henry Allen was a master of stoicism, sacrifice and determination. We’ve absolutely seen Barry displaying all of these characteristics, and they all come crashing together in “Trial of the Flash.” Here he passes through the gauntlet of being falsely accused and incapable of proving his innocence in a manner that recalls the trial of Henry Allen for the murder of his wife. Where the comic and the television version of “The Trial of the Flash” converge is in the character of Cecile. She is Barry’s lawyer in both realities and strongly advocates a public unmasking in order to clear her client’s name. In the comics, she does unmask Barry, but through some awesome comic book logic the citizens of Gorilla City had changed Barry’s appearance and Barry Allen retains his separate identity from the Flash. The TV side of the storyline showed Barry simply refusing to out himself. It was hard for me, personally, to decide if this was a good idea. It might not be up on the level of whether or not Batman should kill the Joker, but the path of least resistance could have saved everybody a lot of heartache—not least of all the members of Team Flash. Just like when Barry returned after “Flashpoint,” actions that he viewed as noble have caused more than a little bit of pain. 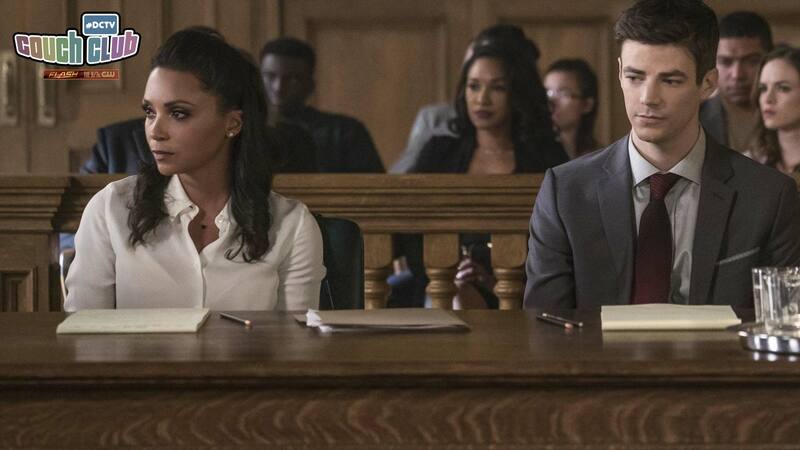 While I’m hoping that Barry doesn’t have to spend too much time incarcerated, I’m also hoping that this trial (inside and outside the courtroom), will strengthen the bond between the members of Team Flash instead of driving a wedge between them. At the end of “The Trial of the Flash” comic book storyline, it is revealed that Abra Kadabra brainwashed Barry Allen into snapping the neck of Reverse-Flash. The likelihood of this coming to pass in the continuity of The Flash seems low, but if it creates an opportunity for Kadabra to guest star on the show again than I am 100% for it. “The Trial of the Flash” feels timely in the wake of pop culture staples like Serial and Making a Murderer. It shows the core good that Barry Allen possesses and it manages to fold in an integral storyline from DC Comics history. For my money, it represents all the best things an episode of The Flash can be, and it was so wonderful to have this be what brings us into the show for a new year. Let me know down in the comments what you liked best about “The Trial of the Flash” and how long you think Barry’s going to be stuck in jail!